In my mind the most beautiful of the 1930's British Tobacco issues featuring ornate framing around an oval color-tinted portrait. 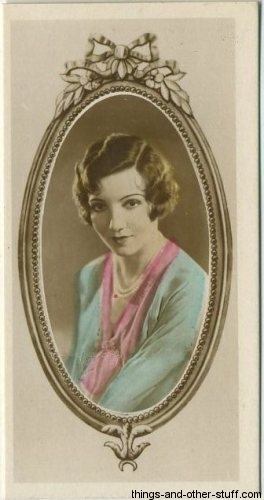 Cards of actresses are very colorful with clothing highlighted and hair colored, the actors are generally duller, though lighter hair is toned. Each card measures approximately 1-5/16" x 2-5/8". The following gallery includes images of all 54 cards plus sample images of the reverse side of the first and last cards in the set. Just click on any image to open to full size and from there you can scroll through them all. Any linked names will take you to an article about that film star found elsewhere on this site. 12 - Douglas Fairbanks Jr.